In all developing Third World countries — both tropical and subtropical — socioeconomic conditions and standards of hygiene and sanitation are less than perfect. 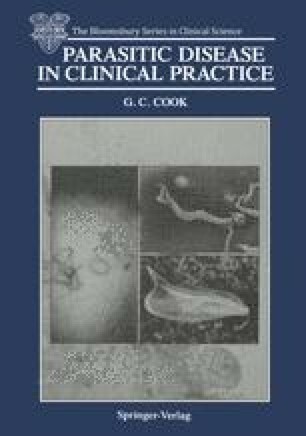 In consequence human infection with a large range of colorectal parasites is common (Cook 1980, 1986a,b, 1988, 1989). Travellers and tourists are also frequently infected and a ‘high index of suspicion’ is required if this group of diseases is to be diagnosed (Walker and Williams 1985). Recently, intestinal parasitic infections have received considerable prominence in relation to immunosuppression (Chaps. 2 and 4) (Cook 1980, 1986b), and this is especially so in patients with HIV infections and in particular those with the end-stage AIDS syndrome (Casemore et al. 1985); active male homosexuals who are HIV-negative are also at a significantly greater risk from some of these infections (Weller 1985).